Get the edge, save time and increase your profits with Australia's #1 daily fantasy and season-long fantasy tools suite. Sign up now to get free access to the entire tools suite.  Our tools are designed to help you build more informed lineups, supported by data and expertise. You are in control of your lineups and your bankroll, we are here to help you take your game to the next level. We utilise our proprietary machine learning technology, tested by daily fantasy sports player dpwoodford, to project the performance of each player, in every game, across a wide range of sports. Historic data, weather conditions, and hundreds of thousands of data points and simulations are analysed to produce projections that give you a massive head-start on your weekly research. 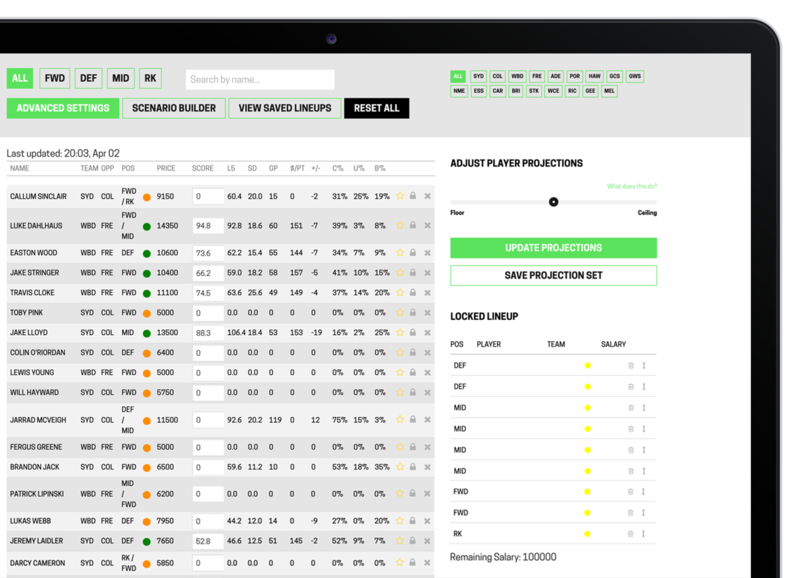 Draftstars and Moneyball players, slates and salaries automatically imported when projections are updated, used to build up to 40 lineups at a time. Tell the cruncher whether you want to focus on player upside or consistency, manage player exposure, consider different game outcomes and more. 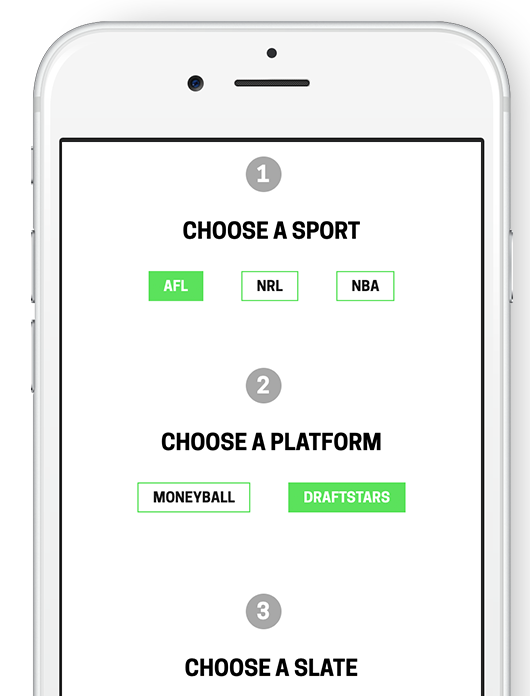 Customise your experience by shortlisting players, saving your settings and saving lineups to revisit later. Get an instant lineup powered by our projections. Swap players in and and out at each position using our simple advice. Randomise from an array of optimal lineups to steer clear of the pack. Create a free account now and start building lineups straight away. Access tools for AFL, NRL, NBA, NFL, Horse Racing and more. Become an Insider, become a winner. Access to the Lineup Cruncher and Smart Lineups is FREE, just create an account and start crunching! 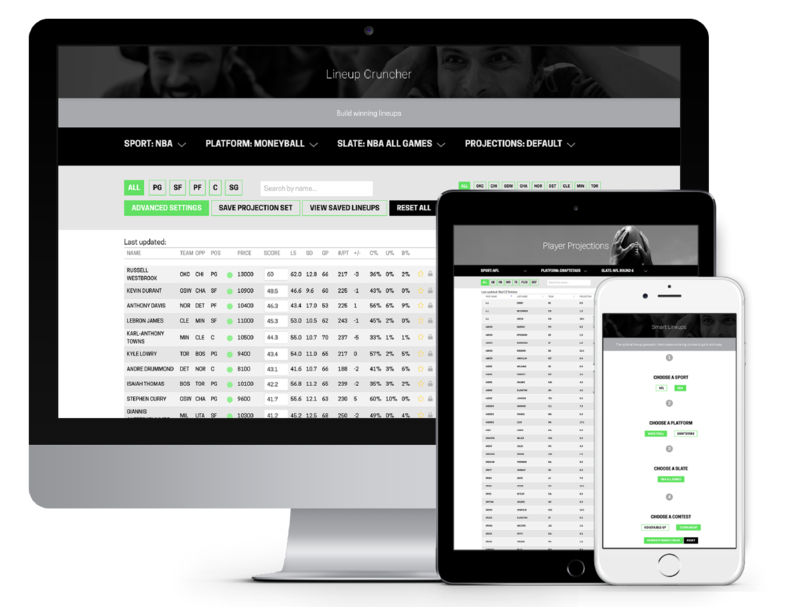 If you're ready to up your game with our player projections and advanced Lineup Cruncher settings, go premium in 2 simple steps. You wouldn’t bet on a horse without looking at the form guide, don’t play fantasy without our tools. Our mission is to give you the information you need to win your competition. I just want to say a big thanks (again) as when I signed up I made a deposit of $80 @ Draftstars […] and by only playing H2Hs and Double Ups I’ve grinded out my bankroll to $931, you can't wipe the ear to ear smile I have […] you’ve got a lifelong subscriber in me...cheers again. [I’ve] been betting on fantasy for 6 months. Recently signed to FI [Fantasy Insider] last week and came 3rd today in Derby comp.. best result so far. The Fantasy Insider crew are quite simply geniuses. While I’ve stumbled around with spreadsheet formulas for years, have automated the process completely and taken on board salaries, form and projections. Their statistical analysis is second to none and I constantly see the dpwoodford name at the top of daily fantasy leaderboards. Anyone can play these games and do not need to be a sports nut, and if you put the research in, there is no reason why anyone can’t win like I have. With the Fantasy Insider subscription in your pocket (which pays for itself pretty quickly), this will further enhance your knowledge and put you in good stead to win some cash to brag about with the boys. I encourage everyone to give the subscription a go and good luck to you all. Your lineup cruncher function definitely helped me select the winning lineup in tonight's Draftstars AFL. Whilst it has taken a little while to collate the info it provides with my own 'hunches’, I feel that it has absolutely helped to streamline team selection. Thanks once again. Fantasy Insider came through with the goods in the BRI v PAR game, picking Nathan Peats as a standout to get 37 points & he got 36.9 points. Thank you again to the team #clutchplay.